Oh that dastardly Amazon. First it upends the book industry, then it turns Bezos from a nerd into some sort of killer robot from the future, and now (in the US at least) it wants to drop loads off in your boot. No, not that, I mean, the company wants to put a package in your trunk. Damn, that’s not it either, how about: Amazon wants to put its valuables inside your things. Okay, this isn’t working. Basically, Amazon Key is a suite of services that lets delivery drivers – or friends and family – enter your home without you being there. The main kit consists of its Cloud Cam and a compatible smart lock, but the company is expanding. Now Amazon is letting people have parcels delivered into their vehicles, as long as these are supported models of course. In the above two minutes, a group of what I can only assume are borderline sociopaths agreed to let Amazon into their cars and then be filmed talking about it. The thing is, and somewhat ironically, I’m not sure I’d let any of these people into my own car. This got me thinking. Which one of these folks would I least like to open my trunk and find there? Would I be happy giving them my keys? If we’re meant to trust Amazon coming into our cars and houses, surely we have to trust the people they choose to advertise the service. This means one thing: ranking the people in the video from most to least trustworthy. Watch the way she says, “The dogs didn’t wake up my kids” when she’s talking about the package being delivered in her car instead of at home. You can tell she’s close to breaking point and this Amazon Key service has actually given her a small oasis of calm in the midst of a never-ending storm of pre-pubescent chaos. While there’s potential there for her to snap, she seems safe enough. Unless those dogs wake up her kids, then pray, damn you, pray for the souls of those hounds, for they surely have been sent hurtling to Hades. She decided to use the Amazon car delivery service, as she needed to buy her daughter’s birthday presents without her offspring finding them, DESPITE THE FACT THAT EVERYTHING IS DELIVERED IN AMAZON BOXES. That is not the decision of a trustworthy individual. And let’s say for argument’s sake that her daughter, without asking, regularly opens packages that come to the house, thus validating this decision? Even less trustworthy imo. Firstly, he owns a truck. That immediately sets off alarm bells in my European mind. What do you need a truck for? Outdoorsy stuff, yeah, but that vehicle is as clean as a whistle. He doesn’t take that off-road, he just cruises around town early in the morning when his family is asleep, revving his engine at the traffic lights, remembering when he was young and slim, when he won his team the big games in the days before his knee blew out and – with the truck rumbling beneath him – wonders why it feels like his life has been on a downward spiral since then. I mean, probably. What do I know? Secondly, he seems perfectly cool that a brown package is just hidden under his child’s safety seat, impressed even by the fact that it was “hidden.” I’ve seen enough horror movies to know that complimenting someone who can get into your car for their hiding skills is the move of a fool. And, ultimately, what are fools? Untrustworthy. This fellow has the briefest appearance in the promotional video, and for good reason. He spends his time obviously reading his lines – which seem to be held up to the side of the camera – meaning his gaze is consistently, and creepily, off-center. Once you get over that though, you listen to what he’s talking about. He says that the new Amazon Key car service is great for families with two vehicles, as one can be left at home as the delivery locker, while everyone is out, and I quote, “doing stuff” in the other. Yes, we’ve made it, the most untrustworthy man in the video has arrived. I know appearances can be deceiving, but that low-zipped jumper (with an upturned collar I’d like to add) shows an awful lot of skin and gold chain – none of which I’d associate with someone high on the trustworthiness scale. I’m not one to judge too harshly, but no trustworthy person ever said sentences like that, let alone while showing that much chest off. 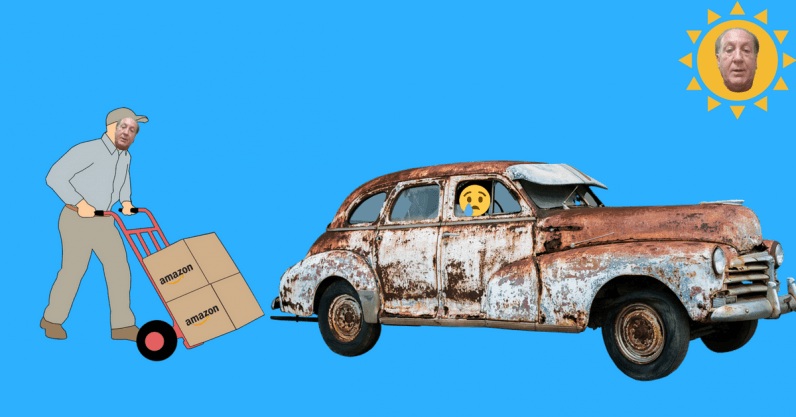 Well, if you’d like to let Amazon put a package in your trunk, you can find out more here. While if you’d like to get an Amazon Key Home Kit, you can head here.